Reflection silencers are normally used for reducing low frequencies. They are based on the principle of the reflection of sound waves at cross-sectional jumps and at open ends of ducts or pipes. Reflection silencers are especially effective for tonal frequency components. In contrast to absorption silencers where sound energy is converted into warmth due to friction, reflection silencers reduce sound using reflection and selective overlapping of sound waves. In order to design reflection silencers, the properties of the medium (pressure, temperature, gas composition) as well as an exact spectrum of the sound source to be dampened is needed. 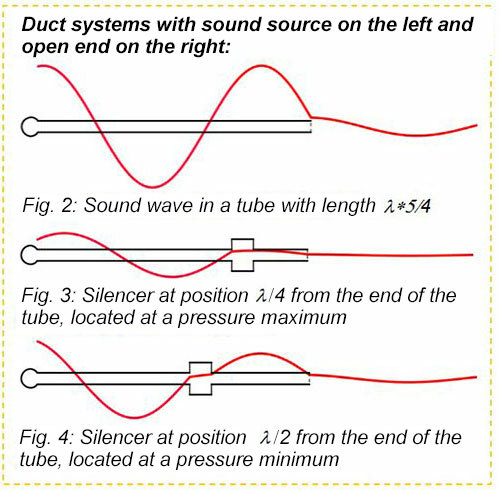 In an acoustically narrow tube, an even sound wave is running from the left to the end of the tube (right). There, the sound wave is being reflected. The reflection is mathematically described with an inverted algebraic sign, and the sound wave reflected is running from the right to the left. Overlapping of both waves results in a standing wave (red) inside the tube. The efficiency of a reflection silencer predominantly depends on the installation position within the tube. Fig. 2 shows the sound field inside a tube whose length is equal to 5/4 of the sound wavelength. Assuming a suitable sound source, inside the tube a resonance builds up that leads to good (i.e. high) sound radiation. With a silencer located at the position of a pressure maximum before the mouth (fig. 3), the sound field changes drastically. With a silencer located at the position of a pressure minimum before the mouth (fig. 4), the sound field exhibits minor changes. In collaboration with Prof. Dr.-Ing. F. Kunz, University of Applied Sciences in Bingen, IBS offers designing reflection silencers in a problem-specific way, based on calculations. In addition, we can develop construction-based suggestions for solving your acoustical problem. (contact).